I love wearing dresses and find that I just don’t wear them very often. I have been inspired by a great blog, Everyday in a Dress and am going to try to wear at least one dress or skirt a week. 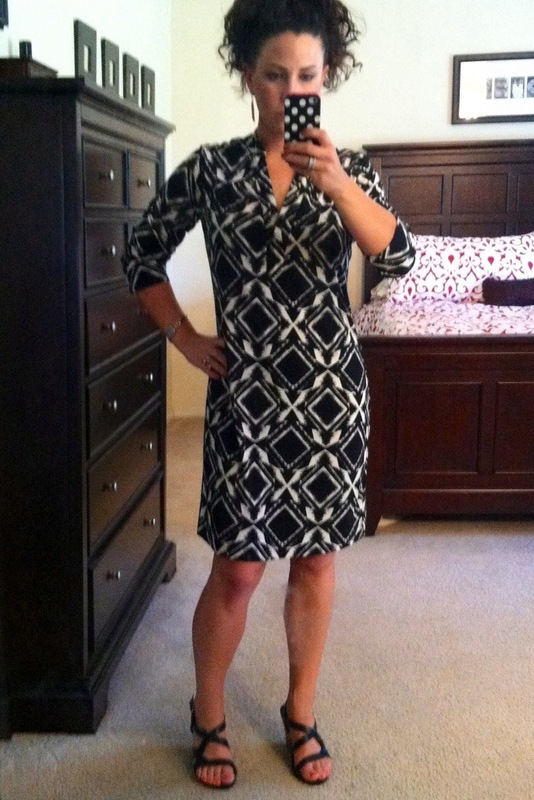 Black and white geometric print dress $15 from Banana Republic Outlet, last seen here. I think this dress is very versatile and can be worn practically all-year round by changing up shoes, leggings and adding cute sweaters or jackets. I really try to buy clothes that are versatile and not just for one season when I can. Black strappy wedges not sure what I paid for them, but I remember buying them at a Bass Shoes Outlet, aka comfort shoes store, for work five years ago. These are by far the most comfortable pair of wedges I own, possibly because they are only about three inches. Don’t overlook comfort shoe stores, not all of the shoes are ugly or something that a grandma would wear, though there are plenty of those as well! Gold and coral earrings $3.98 from Target, last seen here. 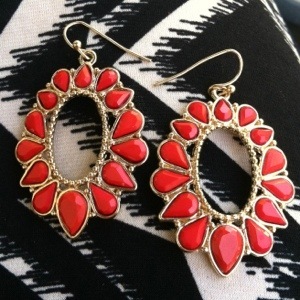 These were a great find and I like how the earrings mirror the print of the dress and give a nice pop of color! Thanks so much! Prints are so fun! Thank you Jen! Accessories are so fun and inexpensive, plus they add so much to an outfit! Wonderful outfit… with a lovely dress. I like the look! Thank you! It’s hard to go wrong with black and white! oh, yes. My favourite color combination by a mile!